Waiting for Walker was one of the most challenging stories I've written. And I'd like to hear from readers about how I handled a couple of these challenges. As many readers have noted, my stories tend to include unusual or even esoteric topics in support of the characters and the plot. Examples are dog behavior; synesthesia; autism; transgender; intersex; Paganism; the list is long. I enjoy the research necessary to present unusual topics, and sometimes I rely on subject matter experts. But the story Waiting for Walker includes topics that were more challenging to me than usual. In my Author's Note at the back of the book, I indicated that I would set up space for comments about my success regarding these challenges. This is that space. The story includes a U.S. soldier's conversion to Islam and what it was like for him and for his Afghani Muslim bride when he brought her to his home in Connecticut. To do this credibly and sensitively, I felt I needed to go deep enough into Islam to present it in support of this story without putting myself forth as any kind of expert—and, in my limited knowledge, without giving offense. My stories are the stories of my characters; they tell me who they are, what their dreams are, how they react to the world around them, and how they live their lives. I go where they tell me to go. Could I refuse to follow the dictates of characters? Yes; but—why? In fact, in light of the hate mongering and bigotry in today's world toward Muslims (here is just one example), I was glad the story line went in the direction it did; it gave me a chance to present Islam and Muslims in a favorable light and, I hope, to represent sensitively some of the challenges they face in trying to become accepted members of Western society. In my opinion, we don't have enough stories like this. I reject the old advice that writers should write only about what they know. While I believe it's good to begin there, what writers know can effectively lead them—and their readers—into fascinating new areas of life where they had not yet ventured. Without imagination, writers cannot write creatively, and they should not limit themselves to what they already know any more than visual artists should do so. 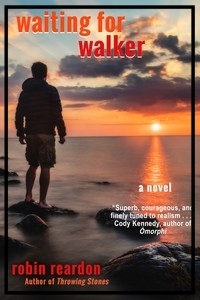 For those of you who have read Waiting for Walker and would like to comment about anything, but in particular about my treatment of Afghanistan and/or Islam, please use the comment section below, whether complimenting or criticizing. My effort was done in good faith; if that has failed, I'd like to know.